The first quarter of 2019 has brought many new developments for Twin Climbs: new hold making methods, new workspace and new sales format. With the help of climbing hold guru Will Watkins, we are modifying the way we produce climbing holds. Combining our technology with conventional hold carving opens up new avenues to incorporate curves, tapers and larger holds, ensuring the holds are aesthetic in gyms and better reflect the outdoor movements. Take this starting hand hold for example, it’s a two finger pocket which favours pulling down-right. Outdoors your back two fingers sit against the wall. But, on our old hold they’d hang in the air. The new hold corrects for this by extending the area and including a more gradual taper. In the next few months we'll be developing the rest of our holds using this new method. Finding workspace in Sydney can get very expensive, very quickly. Adding to this, being a climbing hold manufacturer, we need to work with plastics in precise environmental conditions. Luckily for us UNSW and UNSW Founders have provided us with some excellent workspace for us to keep working on the holds and bringing the best climbing routes to your gyms. The new space has been a key development, allowing us ideal conditions to prototype our new holds. 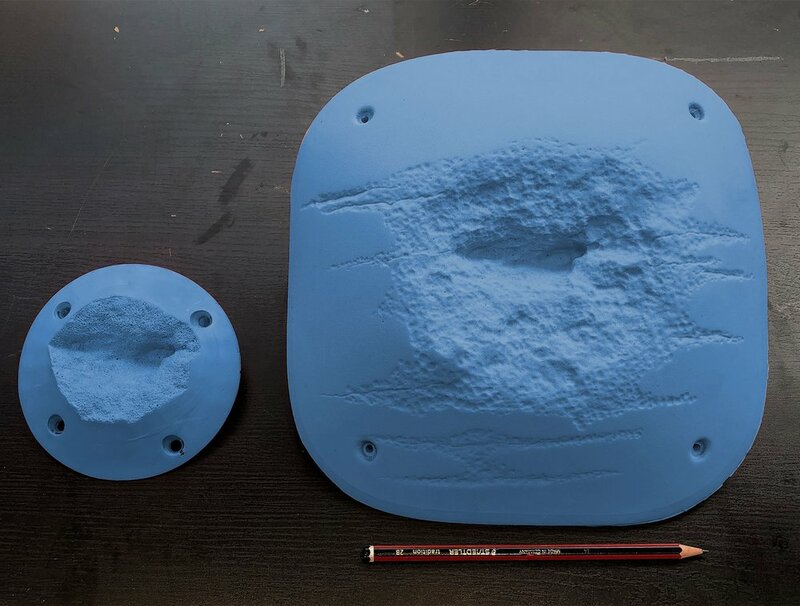 After prototyping, our holds will be sent off to a laboratory to have masters developed and the highest quality materials used to manufacture the holds. We're getting a cool, new look website. In transitioning from concept validation to creating a commercial product, we are currently updating our website, helping to streamline online sales. When ordering from us, gyms (and climbers) will be able to order and pay for the holds on our website, then have them shipped out to anywhere in the world. While climbing hold sales have been completed time and time again, we are bringing a new package format to the climbing hold industry, in which a plug-and-play social media package will be included with each purchase. So customers can easily show off their new sets of holds. This idea was developed throughout products trials, when our social media posts have been some of the highest performing content for our trial partners.